WP Project Manager has built-in email notification system for each and every feature, like- assigning to a project or task, messaging, completing a task and sending daily digests. You will find the email settings in Project Manager → Settings → Email Settings. From E-mail Address: You may know that each email contains information about from where it was sent and where should the replies go to. By default, WP Project Manager picks up the admin email address. If you want to use a different email or a cool email address like no-reply@organization.com then you can write it here. Putting a familiar organization email address will save your emails from the spam filters. So the best practice would be using info or contact email which is the most used email address of your organization. Links in the Email: You may already know that WP Project Manager has built-in front-end feature. So if you have locked the backend access and want the users to manage everything from the frontend, then you should select Link to Front-end. 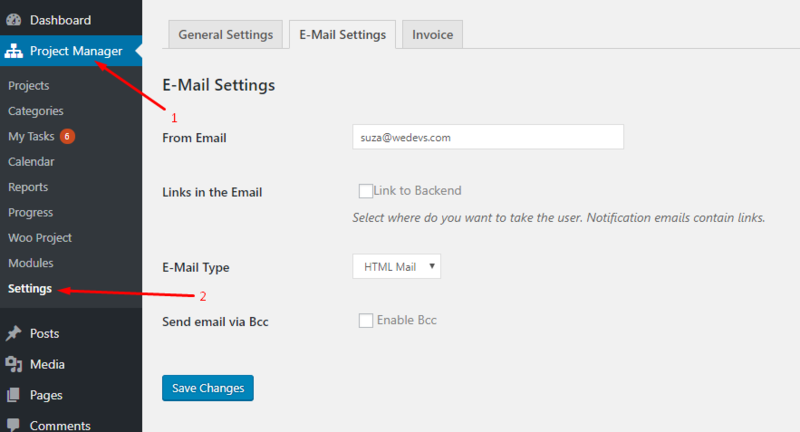 By default, Link to Backend is selected and all the links in the email about tasks, messages, and files are placed to the backend. E-mail Type: If you do not like the notification emails with colors and graphics and prefer text-only emails, then you can select Plain text. Else HTML emails will be fine. Send Email via BCC: Normally, if there are multiple people attached to a thread, then the emails are sent using CC feature. If you do not want to reveal other users email address, then you can enable BCC.